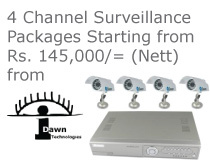 IDawn Technologies is a leading provider of Closed Circuit TV Security Systems for major companies around the island. Our CCTV Systems are designed, cabled, and installed to the highest standards with multiple fail safes to ensure that there will be no holes in your security coverage. Other than CCTV Systems, IDawn Technologies also offers a variety of Access Control Systems, and Intrusion Detection Systems (traditional Burglar Alarms). As of December 2010, we will be offering a new line of Custom Fabricated Plywood Doors (made in Sri Lanka) with Access Control Systems built into the doors themselves.